I am writing this on the evening of Good Friday. They say that Filipinos have one of the most intriguing celebration of the Holy Week — often timed deep-rooted in tradition, mixed with centuries’ old mysticism and a benevolence and penance that can only be interpreted as both masochistic and deeply, truly religious. In the old times, people stay at home. But lately, Filipinos often take a mass exodus from the city going to different destinations to officially start their summer vacations. Since there’s no Facebook, Twitter or Instagram in the olden days, people assume that people stay in and pray for the Holy Week. But now, you can pretty much figure out that people will be busting their swimming suits out as soon as Maundy Thursday rolls around. Unfortunately, in my mother’s household is almost akin to selling out your master for 30 pieces of silver. It is forbidden and the last time we tried to ditch the family tradition of “Pabasa” (a retelling of the Passion of the Christ in singing form), our mother did not talk to us by the time we arrived Saturday evening until the end of Easter. And we had to say we are sorry for ditching the Pabasa. That was 8 years ago and we never again attempted to schedule a vacation during Holy Week. This year, I resolved to do little acts of penance to mark the occasion. 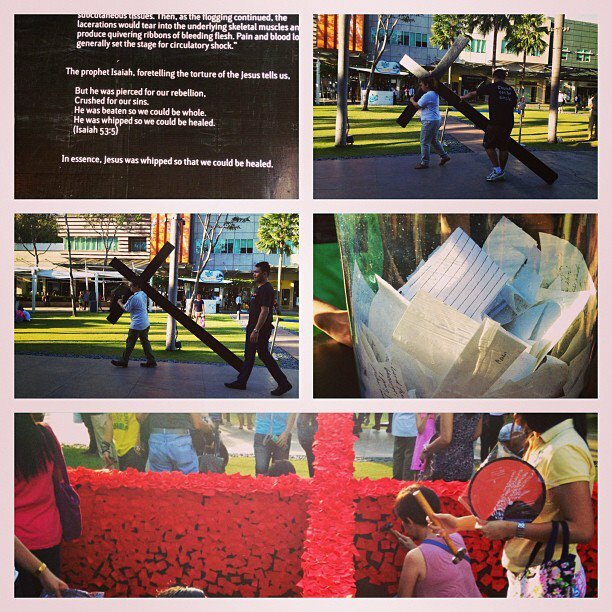 The hubby and I finally went to St. Pio of Pietralcina Chapel in Eastwood then attended the modern Station of the Cross commissioned by Church Simplified at Bonifacio High Street in Taguig. It’s my second year to attend the modern interactive Stations of the Cross and this year has more participants compared to the recent years. Walkway: Reflections on the Stations of the Cross is a modern and creative interpretation of the age-old Christian tradition of reliving the fourteen Stations of the Cross of Christ’ passion. The site, located at the BHS grounds features fourteen interactive stations based on the gospel accounts of Matthew, Mark, Luke and John are set up throughout the mall grounds to hopefully bring a fresh lens on the events that surround Christ’s death and resurrection. (SOURCE) This activity gives participants to complete a series of tasks in relation to the message or the lesson imparted per station. In the past years I’ve attended the Walkway, I always shy away from carrying the cross, a representation of how Jesus carried his cross and traveled far from the temple to his place of death, Golgotha. While many people always tried this activity, I was afraid to carry the cross at first because I didn’t want to look stupid in case my clumsy self falls while carrying the heavy cross. The picture above shows Hubby and I getting our turn on the cross. I tell you, that thing weighted a ton and dragging it barely 100 steps from start to beginning is like lugging a house on my shoulders. It was so painful and difficult, plus the fact that people’s eyes are trained on you has a way of getting to your head. While dragging the cross and doing my best not to fall from its weight, I am reminded of Jesus’ greatest sacrifice for mankind. While I am not a very religious person, I have mad faith in God — the faith that keeps me going and keeps me fighting, knowing that with Him guiding me, nothing is impossible.